COZY COTTAGE on quiet street near Lithia Park, Town and Festival! This comfortable separate ONE BEDROOM cottage is located on the best street in Ashland! It is a lovely 4 minute STROLL to Lithia Park, town and another 2 minutes to the Shakespeare Festival. It has off-street parking. The cottage is decorated in rustic elegance with crisp cotton sheets in summer and flannel sheets in winter. Snuggle under the down comforter and sleep with the soothing colors and QUIET upstairs atmosphere with a view of our GARDENS. Kitchen includes everything you’ll need for cooking, including FILTERED water, ORGANIC COFFEE and TEAS and a view of Grizzly Peak. Living room features a comfortable couch and chair, great VIEWS and LIGHT, 32" HD ROKU Smart Television and Wi-Fi internet access. There are locally hand-made SOAPS in the bathroom with a SHOWER and BATHTUB. There are always fresh FLOWERS on the table where you will enjoy eating and gazing out the bay window. The town of Ashland, known for the Oregon Shakespeare Festival, offers abundant opportunities for enjoyment. Browse in the many stores downtown. Dine in Ashland's excellent restaurants. Wander through the lush 100 acres of Lithia Park. Shakespeare, concerts and ballet in the Lithia Park Bandshell can be heard in the distance on warm summer nights. We've lived in Ashland for over 40 years, raised our son here and have some lovely friends, SO many who lived in the cottage and moved into Ashland! Pine Street is two blocks from town and Lithia Park, it's quiet, yet near everything!! We have lovely gardens, many places to sit outside, all the privacy you need. Close to everything, but still quiet. This is the BEST neighborhood, near town and restaurants, walk home safely at night and feel like you're far from town. A nice size bathroom with tub and shower, handmade soap, fluffy towels and good light. Full use of our gardens, outdoor seating and hammock. Filtered water, use of our gardens, outdoor seating and hammock. This is the perfect stay for a couple who wants to have a month long experience of Ashland. The property is beautifully maintained by Melody and Jeff and they make you feel part of the community with their conversations and suggestions. The cottage is perfect to move in for the month. This is our second stay and this time we didn’t bring anything extra for cooking or such - it was all there - nice and cozy. Stayed two months for our second stay here at the Cozy Cottage. The location is great, an easy walk to town and everything it has to offer. Our now friends, the owners, live next door and couldn't be nicer. They really want their guests to be comfortable and happy and will bend over backwards to make sure they are. We already have plans to come back next year. Melody and Jeff are always the best hosts. Their spot in a gorgeous town is so great we’ve rented for the past 8 summers. Looking forward to next summer! Everything works out on Pine St! We were so fortunate to find this last-minute rental and couldn’t have been happier during our month-long stay with Jeff, Melody and Monkey (the cat)! From the start, we were welcomed with friendliness and hospitality which extended to wonderful conversations, shared produce from the gardens, and we were even treated to a band rehearsal session by Jeff and their son, Julian. In it all, Melody and Jeff were extremely respectful of our privacy and desire for a quiet, relaxed stay. They provided a lovely hammock, outdoor seating and beautiful grounds to explore as well. 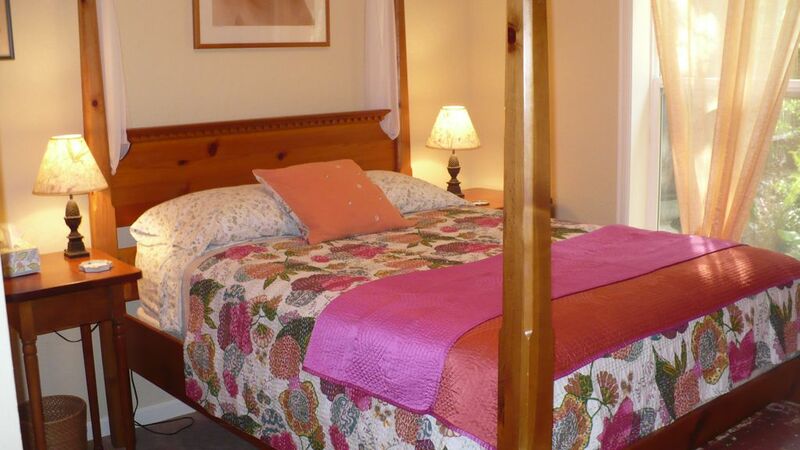 The cottage itself is comfortable for two and fully equipped with anything you might need for a stay here. Melody also made sure to keep us stocked with toilet paper, fresh towels and linens, including a comforter for every weather condition we could possibly experience during the month of September! The fresh flowers from their garden that graced our little home was another beautiful touch. The location is incredibly quiet and scenic, yet a quick 5 minute walk to downtown and Lithia Park. We walked everywhere, explored some nearby hiking trails and kept our car safely parked in the driveway for most of our stay. Overall, we highly recommend the Pine St. cottage! The Pine Street Cottage is in walking distance of the heart of Ashland--including the festival, Lithia Park, downtown shops and restaurants, and the best food coop in Oregon. The cottage is situated above a quiet office in the historic district on a large lot that features morning sunlight in the living room, gardens, shade trees, and good views of local wildlife--especially the birds that frequent the greener parts of town. The kitchenette is fully equipped and the living area and bedroom are furnished with every convenience. Unlike many vacation rentals in the area, this one features a full bath with tub. It is compact and therefore perfect for one or for two who thrive on intimacy. Ashland insiders Melody and Jeff are excellent, experienced hosts who respond quickly on the rare occasions when repairs are needed and are gracious, considerate, and fun to be around. The neighbors are quiet and considerate and the back yard is a wonderful place to sit and read or to dine al fresco. In short, an ideal vacation rental in a great location in a beautiful part of Oregon. My husband and I had a great stay in this cozy cottage. We loved the location - an easy walk to town and theatres. The lovely owners, Melody and Jeff, live right next door, and immediately made us feel welcome, comfortable and at home. They provided many nice touches, such as fresh flowers and home grown produce. They bent over backwards to provide anything we might need. We are already planning a return stay next year. This is our new Ashland home! From Pine Street, it's a 4 minute stroll to Lithia Park and town and then another 2 minutes to the Shakespeare Festival. You will love it!